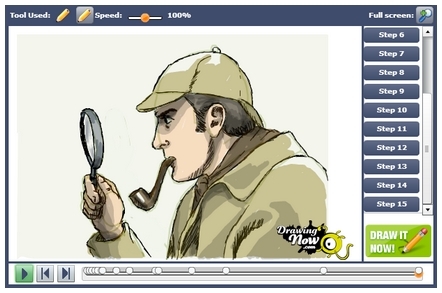 This video shows how can you draw Sherlock Holmes in 15 step. You can make your drawing using pencil, ink, crayon or watercolors. To start the program click on the picture, then press the play button. The drawingnow.com kindly gave the permission to use this draw. We are very grateful. Make your own Sherlock Holmes picture! Keywords: How to draw Sherlock Holmes? Sherlock fanart. Sherlock pencil draw. Drawing Sherlock. How can I make Sherlock picture? Sherlock Crayon, watercolors paint, ink.